Cryo EM is a microscopy technique in which the sample to be viewed is frozen in a very cold liquid refrigerant in order to preserve and protect it during observation. Biological molecules need a solvent to be stable. In most cases, a water/salt solution is enough. 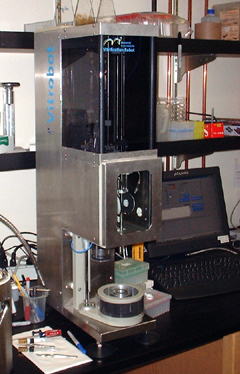 Evaporation, however, needs to be eliminated when a sample is inserted into the electron beam. This can be accomplished by either blotting the sample dry for negative staining (see previous section), or by freezing. Freezing a sample is as simple as dropping a prepared grid into a very cold storage medium. The solvent water around the sample is frozen in place, and the sample is cryogenically protected. In actuality, however, the process is not this simple. First, the freezing process must be quick enough to prevent the frozen water from forming cubic ice. Cubic ice is water in a crystal lattice that readily absorbs the electron beam, obscuring the sample. Preventing cubic ice can be accomplished by using a sufficiently cold freezing agent. 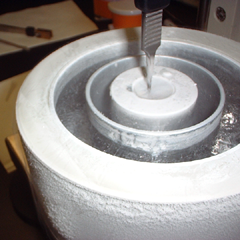 If the sample freezing is quick enough, the water will only solidify as an amorphous solid (vitreous ice) and not have a chance to crystallize. Liquid nitrogen is at a cold enough temperature (approx. -195 °C) to speed the process. Unfortunately, it's heat capacity is very low. Therefore, as soon as a grid at room temperature is dropped into the liquid nitrogen, some of it will warm and boil off, slowing the freezing process and allowing cubic ice to form. Ethane has a much higher heat capacity than liquid nitrogen and is also liquid at temperatures just slightly above those of liquid nitrogen. Therefore, liquid ethane is cold enough (it's melting point is -188 °C) to freeze water quickly and correctly, while not boiling off in the process. The very properties that make liquid ethane such a favorable cryogen also make it dangerous to work with. Some safety issues must be dealt with before using. Figure 1. Schematic of a freeze plunger. A drop of the sample is placed at the end of the plunger and rapidly immersed into the cryogen tank. As mentioned above, a biological sample is quickly frozen to preserve it's hydrated state. 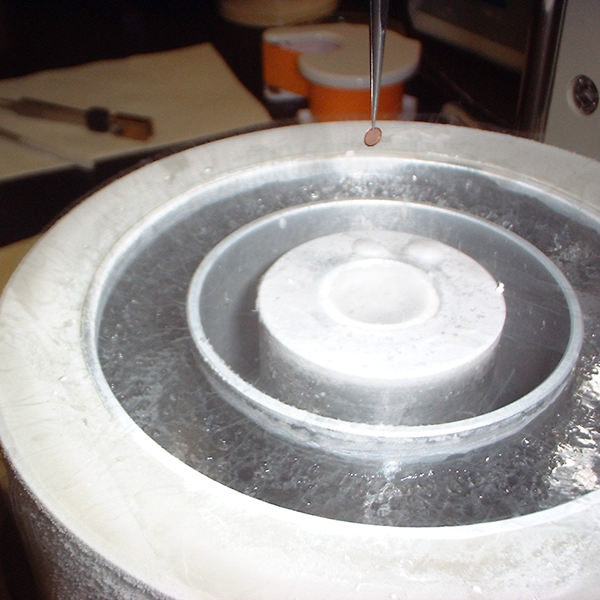 The following illustrates one example of how the sample is immersed into the cryogen for freezing. A small vial of ethane (cryogen tank in Figure 1) is placed inside a larger liquid nitrogen reservoir. An EM grid is held in place at the bottom of a plunger (usually by fine tweezers). The plunger has a heavy weight at the top for extra force. Once the ethane in the vial is completely frozen, it needs to be slightly melted. 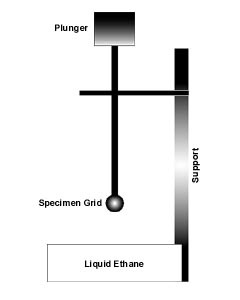 When this small volume of liquid ethane is ready, a few microliters of the sample is placed on the grid. A piece of filter paper is then pressed against the sample to blot of the excess buffer. After a predetermined time, the filter paper is removed, and the plunger is allowed to drop into the liquid ethane. Once the grid enters the liquid ethane, the sample is rapidly frozen, and the grid can then be moved to a storage box in liquid nitrogen for later use in the microscope. Several modifications are common to this procedure. First, the blotting and plunging can be done in a high humidity temperature controlled chamber. This allows the operator to more carefully control the amount of solvent that is left on the grid. If too much water remains, the resulting ice will be too thick for observation. If too much water is removed, the sample will interact with the surface and perhaps be disturbed. Therefore, having the right amount of solvent is of utmost importance. Figure 3. The freezing chamber of Vitrobot™ with a grid suspended before (top - Larger view) freezing, and after dunking into liquid ethane (bottom - Larger view). The outer ring contains liquid nitrogen to keep the entire chamber at the right temperature. Another common modification involves changing the biological conditions just before plunging. Since some proteins can react to changes in their environment with millisecond resolution, manually changing the conditions before plunging will not work. In these cases, some research groups have designed spray mechanisms that spray the plunging grid with a different buffer just before it enters the cryogen. For example, the acetylcholine receptor has been imaged with and without an acetylcholine ligand using this mechanism. The release of the ligand is too quick, so acetylcholine is sprayed on the grid just before it is frozen.